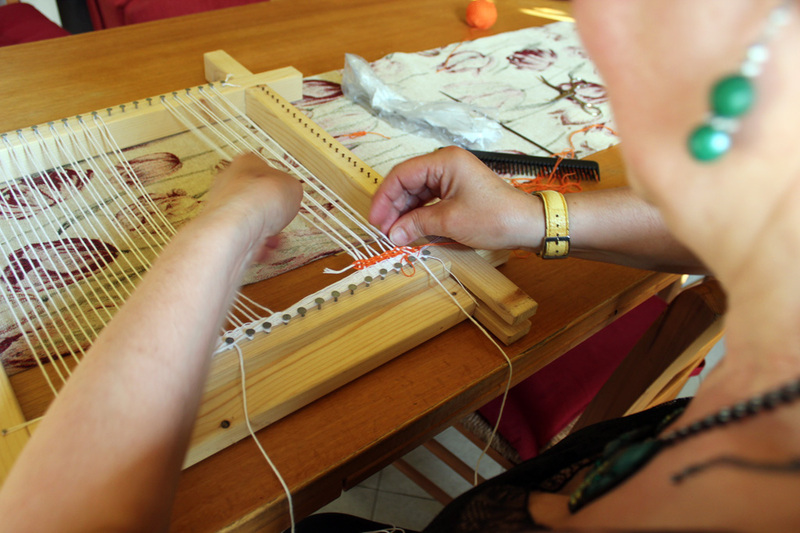 Patrizia Palazzetti, a weaver, demonstrates how to string a simple loom to create one of her colorful works of art. Photo taken in Cagli, Italy, on 18 June 2013. Photo by Deanna Titzler/Gonzaga in Cagli. 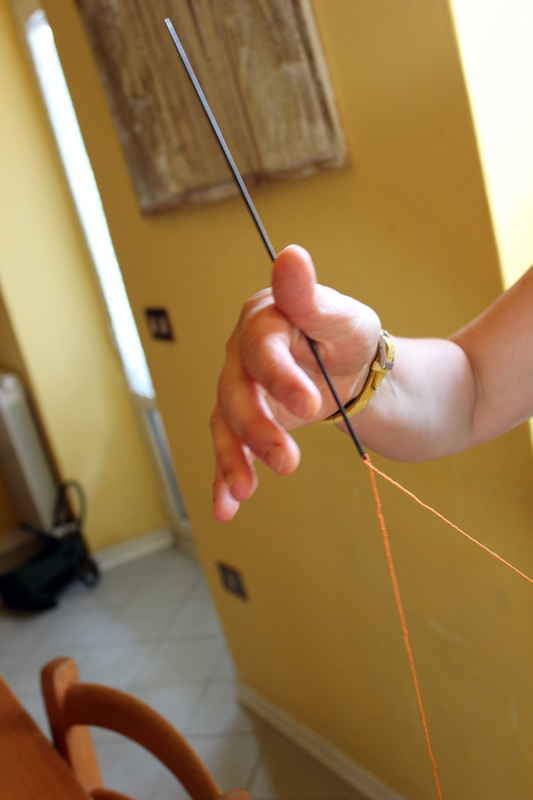 Patrizia Palazzetti, threads an oversized needle with thin, orange yarn, which will be used in a new weaving project. Photo taken in Cagli, Italy, on 18 June 2013. Photo by Deanna Titzler/Gonzaga in Cagli. 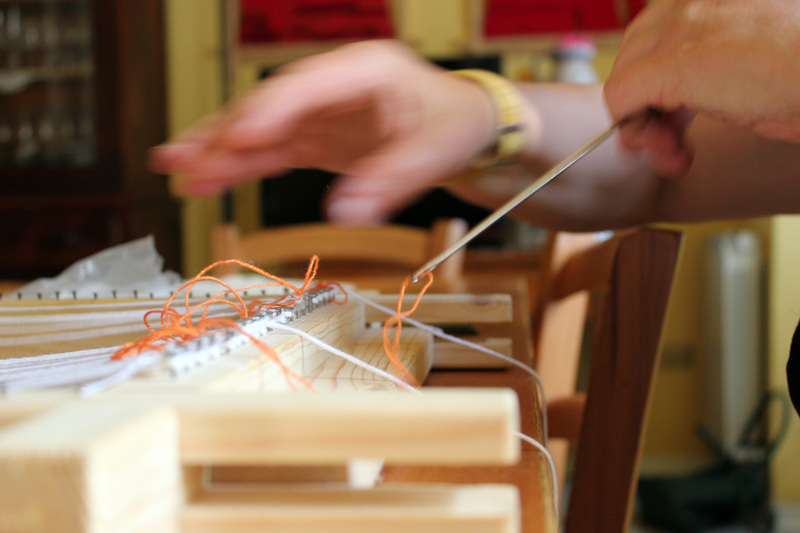 Patrizia Palazzetti's hands work quickly as she creates a new weaving on her simple loom. Photo taken in Cagli, Italy, on 18 June 2013. Photo by Deanna Titzler/Gonzaga in Cagli. 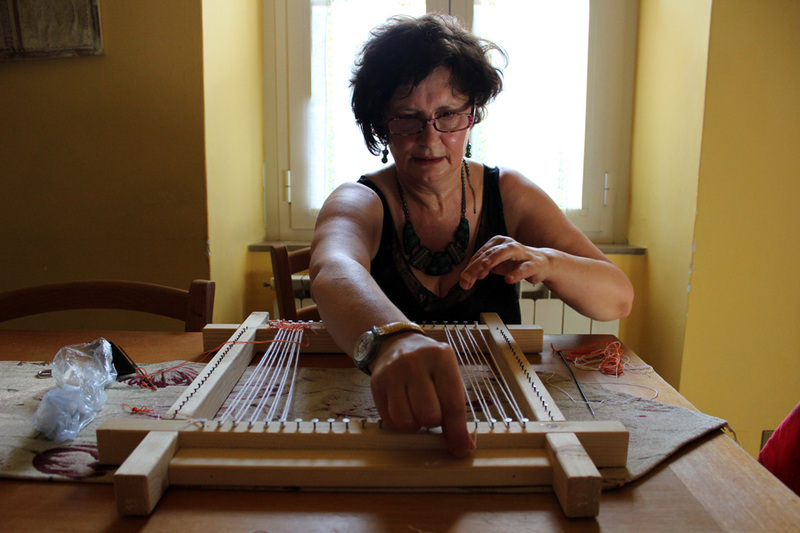 Patrizia Palazzetti uses simple tools, such as a long needle and a black hair comb, to make her complex works of art in Cagli, Italy, on 18 June 2013. Photo by Deanna Titzler/Gonzaga in Cagli. 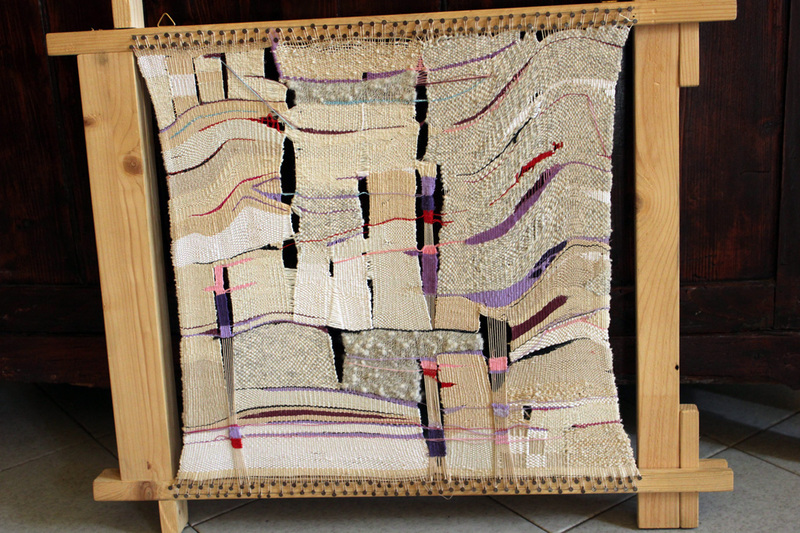 One of Patrizia Palazzetti's finished art pieces includes yarns of different colors weaved together in unique patterns. Photo taken in Cagli, Italy, on 18 June 2013. Photo by Deanna Titzler/Gonzaga in Cagli. 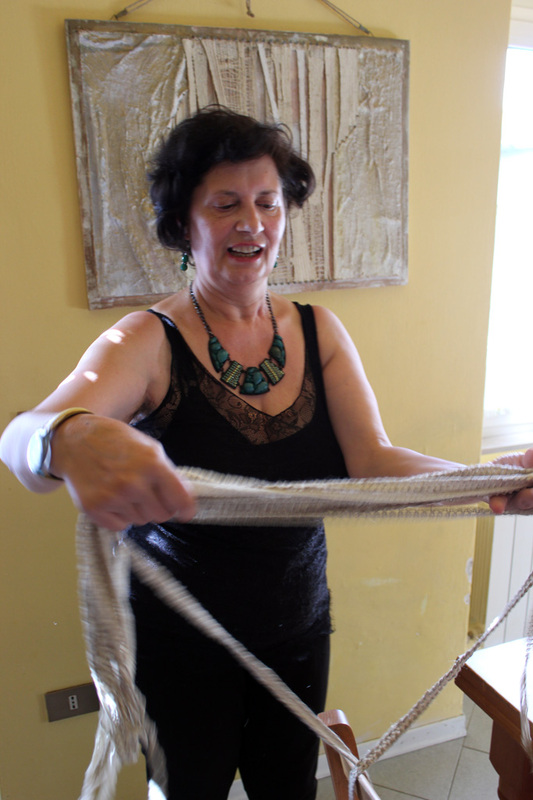 For her weavings, Patrizia Palazzetti prefers to use undyed yarn and ribbons, such as these in her hand and seen in the finished art behind her. Photo taken in Cagli, Italy, on 18 June 2013. Photo by Deanna Titzler/Gonzaga in Cagli. Patrizia Palazzetti's studio is the kitchen table in her apartment located in Cagli, Italy. In this photo, she describes the art she showed in her art exhibition, Tessere. Photo taken on 18 June 2013. Photo by Deanna Titzler/Gonzaga in Cagli.